For all the chaos of The Bolt – and a fallout that kept this scribe awake for 46 hours straight – it would take another 17 days before the full brunt of what was happening really hit. Or began to, as much as it humanly could. Even for the passage of time, few words can suitably describe the events that transpired five years ago this morning and tonight – "emotional" and "surreal" begin to grasp it... all told, though, "disorienting" still fits the bill better than anything else. I welcome you all with great joy and cordially greet each one of you. I thank Cardinal Angelo Sodano [dean of the college], who as always, has been able to convey the sentiments of the College, Cor ad cor loquitur [heart speaking to heart]. Thank you, Your Eminence, from my heart. And referring to the disciples of Emmaus, I would like to say to you all that it has also been a joy for me to walk with you over the years in light of the presence of the Risen Lord. As I said yesterday, in front of thousands of people who filled St. Peter's Square, your closeness, your advice, have been a great help to me in my ministry. In these 8 years we have experienced in faith beautiful moments of radiant light in the Churches’ journey along with times when clouds have darkened the sky. We have tried to serve Christ and his Church with deep and total love which is the soul of our ministry. We have gifted hope that comes from Christ alone, and which alone can illuminate our path. Together we can thank the Lord who has helped us grow in communion, to pray to together, to help you to continue to grow in this deep unity so that the College of Cardinals is like an orchestra, where diversity, an expression of the universal Church, always contributes to a superior harmony of concord. I would like to leave you with a simple thought that is close to my heart, a thought on the Church, Her mystery, which is for all of us, we can say, the reason and the passion of our lives. I am helped by an expression of Romano Guardini’s, written in the year in which the Fathers of the Second Vatican Council approved the Constitution Lumen Gentium, his last with a personal dedication to me, so the words of this book are particularly dear to me. Guardini says: "The Church is not an institution devised and built at table, but a living reality. She lives along the course of time by transforming Herself, like any living being, yet Her nature remains the same. At Her heart is Christ. " This was our experience yesterday, I think, in the square. We could see that the Church is a living body, animated by the Holy Spirit, and truly lives by the power of God, She is in the world but not of the world. She is of God, of Christ, of the Spirit, as we saw yesterday. This is why another eloquent expression of Guardini’s is also true: "The Church is awakening in souls." The Church lives, grows and awakens in those souls which like the Virgin Mary accept and conceive the Word of God by the power of the Holy Spirit. They offer to God their flesh and in their own poverty and humility become capable of giving birth to Christ in the world today. Through the Church the mystery of the Incarnation remains present forever. Christ continues to walk through all times in all places. Let us remain united, dear brothers, to this mystery, in prayer, especially in daily Eucharist, and thus serve the Church and all humanity. This is our joy that no one can take from us. Thank you – thank you from my heart! Resolving the US' largest open seat a bit more quickly than expected, at Roman Noon this Wednesday the Pope named Bishop George Thomas (above) – the 67 year-old head of western Montana's Helena diocese since 2004 – as the third bishop of Las Vegas: carved into a stand-alone diocese just two decades ago, now boomed to some 850,000 Catholics amid Sin City's marked growth. In the post overseeing the five counties of southern Nevada, the Seattle-bred prelate – once the top aide to Archbishop Raymond Hunthausen at the end of his tumultuous tenure – succeeds Bishop Joseph Pepe, who reached the retirement age of 75 last June. A prodigal Philadelphian who landed in Vegas in 2001 after a decade on loan in New Mexico, the departing bishop already moved into his emeritus home last fall. Yet even so, there's arguably one person who's looked forward to this day even more: the bishop's 97 year-old mother, still living in the Roxborough house where he grew up, to which "Joe Pep" plans to return during the warmer months while serving as a hospital chaplain. 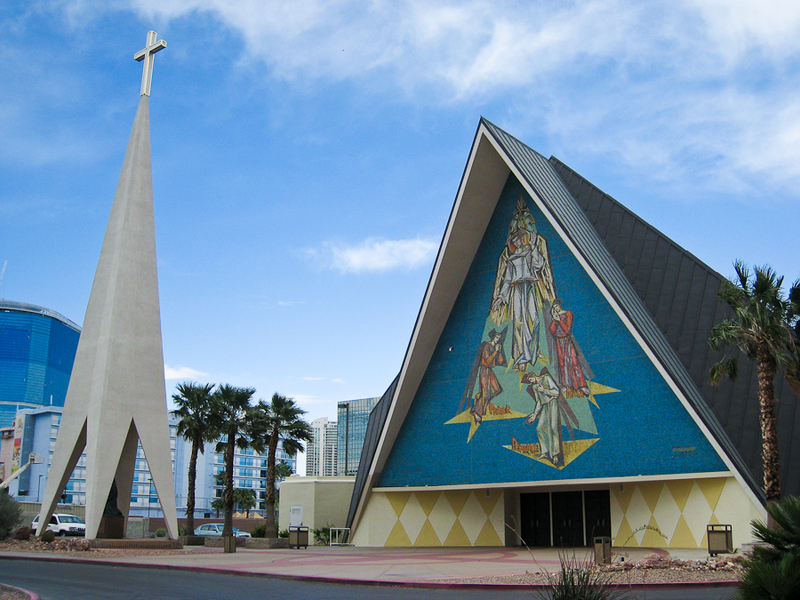 Needless to say, the road to today's move has unfolded in the shadow of immense tragedy: the October 1st massacre that killed 58 and wounded several hundred concert-goers at the Mandalay Bay casino – the deadliest mass shooting in the nation's history, and just a couple blocks from Guardian Angel Cathedral (below) at that. Beyond the fallout of the shooting, the priority issues of Vegas Catholicism boil down to three words: growth, immigration, and vocations. On the latter front, the diocese's 1995 spinoff from Reno left the new fold with all of 19 active incardinated priests in the trenches today, the rest of the gaping need filled by externs and religious clerics. At the same time, the Catholic expansion in the US' fastest-growing metro area saw the construction of a massive high school at a cost approaching $100 million, the project since become the focus of bitter litigation between the diocese and the contractor. Here again, the new arrival's travails are quite well-suited – in Helena, Thomas oversaw the diocese's year-long bankruptcy due to 360 abuse cases he inherited, which resulted in a $21 million settlement alongside a mediation process that's been hailed as a model for resolving the suits in an approach that's more pastoral than legal. In that light, it's especially conspicuous that, with today's nod, Thomas becomes the first US bishop ever to receive a more prominent post after taking a diocese through Chapter 11. As it's early out West, the installation date and other usual bits remain to emerge.... More to come. As the news-cycle already begins to immerse itself in the coming fifth anniversary of Francis' pontificate in two weeks' time, this Monday brings another inflection-point for one of the Pope's key projects – and yet again, one that leaves more questions than answers in its wake. Topping today's batch of appointments, Papa Bergoglio named Msgr Alfred Xuereb (above left) – the 59 year-old Maltese best known for his years as deputy secretary to Benedict XVI – as Nuncio to South Korea and Mongolia, elevating him to the rank of archbishop. Yet while the pick's history with the Pope-emeritus has garnered no shortage of sentimental headlines, the move's real ramifications lie elsewhere, reaching right to the heart of both the reigning Pope's foreign policy, not to mention Francis' attempts at reform within the Vatican itself. First, given the current drama surrounding North Korea's nuclear ambitions, even if the Nunciature in Seoul is long accustomed to being a global hotspot, in the present moment it's arguably one of the most critical postings in papal diplomacy. As the Holy See has no bilateral relations with the Communist North, Xuereb now becomes Francis' de facto legate to the whole of a divided peninsula facing the threat of an epoch-defining war, but the irony is that the new Nuncio has never served in the diplomatic corps, his career spent instead as a nuts-and-bolts administrator. All that said, Xuereb's closeness to Francis – who inherited the Maltese as his top personal aide upon his election – portends an effectiveness of a different sort, and the archbishop-elect's background in organization could well come in handy for humanitarian efforts. Still, as each prior Nuncio to Korea since the South's democratic rebirth in the mid-1980s had come to the posting with decades of experience around the globe, the break from convention is conspicuous, all the more amid the region's backdrop today. Beyond the fluid situation with the North, the incoming legate will face two other notable aspects in the role. First, for just the second time, South Korea's head of state – and the lead figure on any talks with Pyongyang – President Moon Jae-In, is a Catholic, part of a fold whose extraordinary rate of conversions has seen it come to comprise some 15 percent of the South's population within a matter of decades. And with the Korean Church's profile as a dynamic, mission-based outpost – its emergence into the mainstream coming in tandem with a remarkable run on building institutions of education and social service – Xuereb's arrival comes months before the 75th birthday (and hence the succession) of Seoul's Cardinal Andrew Yeom. Ergo, it'll fall to the new Nuncio to lay the groundwork of Francis' first choice to a seat that hasn't merely become one of Asian Catholicism's top pulpits, but one of the global church's most sensitive ones, to boot; with the North almost hermetically sealed off from the outside world, the last several archbishops of Seoul have likewise been tasked with pastoral oversight of the church's small, heavily-monitored remaining presence above the DMZ. Significant and full as the Korean plate is, on the internal front, the one Xuereb leaves behind is even more charged. After Francis took note of the Maltese's adeptness at management, by the end of 2013 the pontiff dispatched his then-secretary to undertake the studies which quickly culminated in the creation of the Secretariat of the Economy – and, with it, a seismic upending of the many-headed financial apparatus which had long been the proverbial "800-lb gorilla" of Vatican scandals. 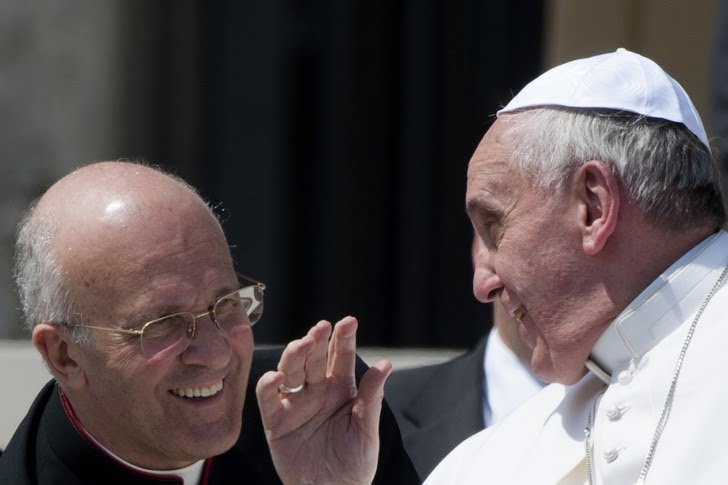 Having tapped the Australian Cardinal George Pell to lead the new organ as the Holy See's first-ever "CFO," armed with a sweeping mandate to wrest all its fiscal, budgetary and personnel operations under his control, Francis named Xuereb as his deputy. And now, after a four-year turf-war saw no shortage of wrenches thrown into the works, both are literally gone: while still holding the title of Prefect, Pell has been in Australia since last July after he was charged there on decades-old allegations of unspecified "sexual offenses," which are slated to come to trial in his home-state of Victoria next month. Regardless of the outcome of the court process, the hostilities aroused by the famously hard-charging Pell's full-on battle for financial supremacy, combined with the stain of the abuse claims and the 76 year-old Aussie's prior complaints of difficult health, have virtually assured that the cardinal won't be returning to Rome. To avoid the appearance of a rush to judgment by the Vatican, however, any successor to him as Prefect for the Economy ostensibly wouldn't be named until after his trial concludes. 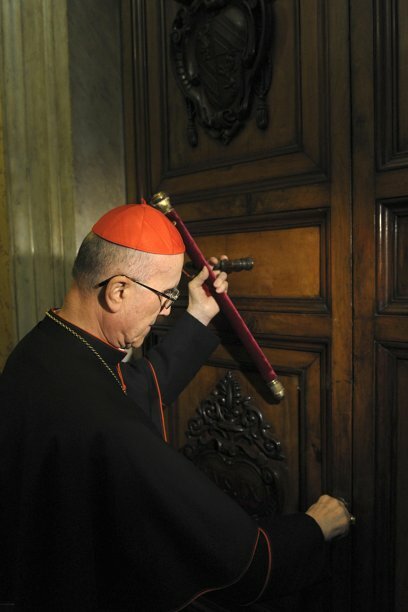 Meanwhile, no successor in Xuereb's Economy role was named today, either, leaving Cardinal Reinhard Marx of Munich – the chair of the 15-person Council which supervises the office – as the last man standing of the three main figures to whom the reform was entrusted, the other lead posts (and only full-time ones) now lacking functioning occupants. Again, today's move brings more questions than answers... but as Francis' 5th comes increasingly into focus and the assessments abound, one of his marquee attempts at a Roman shakeup was just dealt a sizable blow, and maybe even a fatal one. 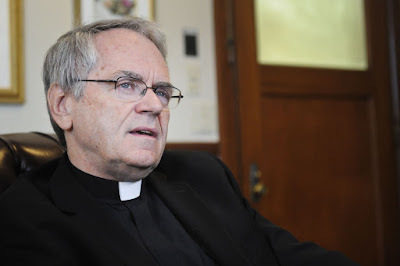 Together with another diplomat elevated today – Msgr José Bettencourt, 54, a Portuguese-born immigrant to Canada named a Nuncio without posting (thus to remain in Rome) – Xuereb is expected to be ordained a bishop by Francis on March 19th: St Joseph's Day, and with it the fifth anniversary of the Pope's inauguration as the church's Universal Pastor. 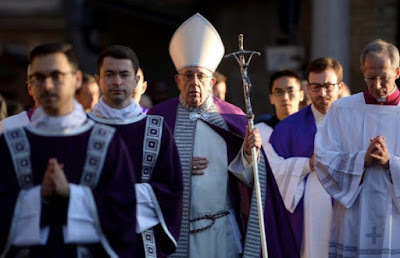 Even as this Ash Wednesday invariably draws the hordes to churches across the globe from dawn to well past dusk, for the Popes, the launch to Lent is always relatively sparse. For some eight centuries, the Bishops of Rome have marked this day away from their daily centers of power – first the Lateran, then the Vatican – instead heading up the Aventine Hill for a penitential procession that, in times past, saw the pontiffs stripped of their splendor, wrapping up with a simple Mass at the Dominican base of Santa Sabina, the first of the traditional station churches. Further marking the sobriety of the day, protocol dictates that the Pope wears the traditional "simplex" miter reserved to him – unadorned white silk, with a thin border in gold – only employed in life on this day, Good Friday and at funerals: most notably of all, the headpiece in which he will eventually be buried. (On this front, Francis has slightly altered the custom, alternating between the customary model and one trimmed in silver, the latter used today.) 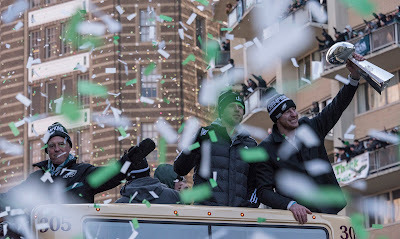 In addition, while the cardinals resident in the city are present as ever for the rite, the starkness of the occasion sees none of them concelebrate. Sure, this has become the most packed church-day of the year... but, for once, to focus on that angle is to miss the point. To one and all on this Ash Wednesday, may every blessing, joy and goodness of Lent be yours – whatever the path, may we all know the grace to make something of these 40 Days ahead. Five years ago today, in the minutes around Roman Noon, the single most stunning and chaotic moment the Vatican beat's ever known broke out. 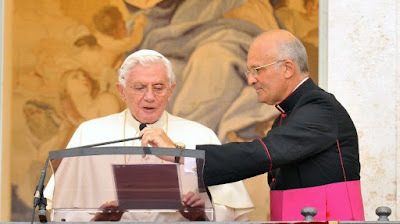 Following the routine business of a consistory to announce canonization dates, Pope Benedict XVI began addressing the 50 or so gathered cardinals and other prelates in Latin. Not many among the group could figure out what he was saying on their own, but the bulging, racing eyes of one who did – the Papal Almoner Archbishop Guido Pozzo, a once and future top negotiator with the SSPX – betrayed the moment's consequence: seventeen days later, the Pope would vacate Peter's Chair in life, its first holder to resign the office for reasons of his age and health since 1296. As Papa Ratzinger left the Sala del Concistoro, some cardinals wept, while others wandered around in a daze. As the Dean of the College, Cardinal Angelo Sodano – informed privately by B16 in an audience three days prior – responded for the group, it came as "a bolt of lightning in a clear blue sky." 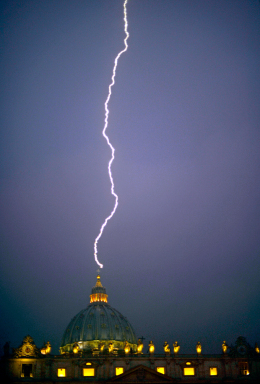 That two separate bolts would strike the dome of St Peter's six hours later (above) merely served to reinforce the point. In the months following the resignation – while Francis took the global stage by storm as Benedict quietly settled into his "monastic" retirement in the Vatican Gardens – no less than the comedian Tracy Morgan still couldn't wrap his mind around it. "It's getting dark out there," the Saturday Night Live and 30 Rock star mused in a late 2013 interview. "The Pope quit. How could that happen? "You can't resign when you have that position," Morgan said. "God doesn't accept that." Sure, the post's 264th occupant saw it differently, not to mention the canons. Nonetheless, what began early on that Monday in February broke open a flood of questions, controversies – and, indeed, complications – which haven't begun to be resolved. 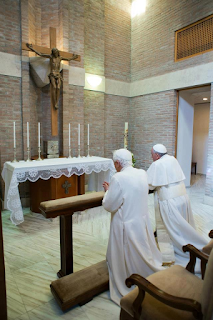 And as the now Pope-emeritus writes of being on a "pilgrimage toward home" amid this anniversary, but one thing is clear: the issues and effects wrought by Benedict's historic departure will outlive him... and, so it seems, likely his successor, too. I have convoked you to this Consistory, not only for the three canonizations, but also to communicate to you a decision of great importance for the life of the Church. After having repeatedly examined my conscience before God, I have come to the certainty that my strengths, due to an advanced age, are no longer suited to an adequate exercise of the Petrine ministry. I am well aware that this ministry, due to its essential spiritual nature, must be carried out not only with words and deeds, but no less with prayer and suffering.